• Situate the vehicle on a flat and solid surface. • Place chocks at front and back of rear wheels. • Attach proper slingers and bolts described in PARTS CATALOG if engine slingers are not equipped. • Always be careful to work safely, avoid forceful or uninstructed operations. • Never start working until exhaust system and coolant are cool enough. • If items or work required are not covered by the engine section, refer to the applicable sections. • Always use the support point specified for lifting. • Use either 2-pole lift type or separate type lift as best you can. If board-on type is used for unavoidable reasons, support at the rear axle jacking point with a transmission jack or similar tool before starting work, in preparation for the backward shift of center of gravity. • For supporting points for lifting and jacking point at rear axle, refer to GI-36, "Garage Jack and Safety Stand and 2-Pole Lift". Remove the engine and the transaxle assembly from the vehicle downward. Separate the engine and the transaxle. 1. Release fuel pressure. Refer to EC-140, "Work Procedure". 2. Drain engine coolant from radiator. Refer to CO-11, "Draining". • Perform this step when the engine is cold. • Never spill engine coolant on drive belts. 3. Remove the following parts. 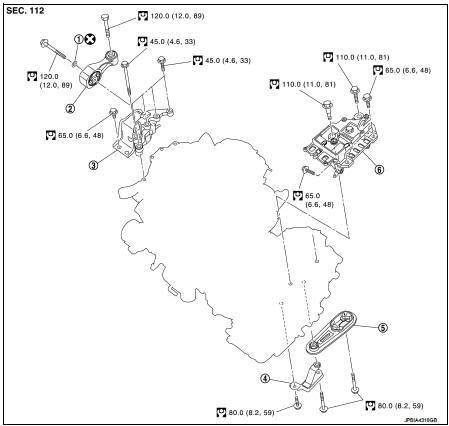 • Front road wheels and tires • Front fender protector (RH and LH): Refer to EXT-22, "Exploded View". • Drive belt: Refer to EM-20, "Removal and Installation". • Engine cover: Refer to EM-25, "Exploded View". • Battery and battery tray: Refer to PG-124, "Exploded View". • Air duct, and air cleaner case assembly and air cleaner body assembly: Refer to EM-26, "Exploded View". 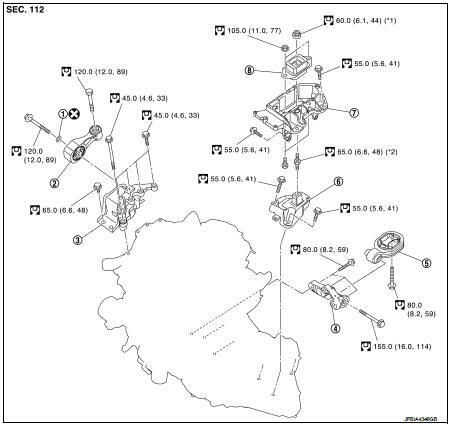 • Radiator hose (upper and lower): Refer to CO-17, "Exploded View". • Exhaust front tube: Refer to EX-5, "Exploded View". • Radiator cooling fan assembly: Refer to CO-20, "Exploded View". • Charger air cooler: Refer to EM-31, "Exploded View". • Alternator: Refer to CHG-30, "MR16DDT : Exploded View". 1. Disconnect all connections of engine harness around the battery, and then temporarily secure the engine harness into the engine side. Protect connectors using a resin bag against foreign materials during the operation. 2. Disconnect fuel feed hose quick connector. Refer to EM-43, "Exploded View". 3. Disconnect heater hoses. Refer to CO-26, "Exploded View". 4. Disconnect control linkage from transaxle. Refer to TM-78, "Exploded View". 5. Remove EVAP hoses. Refer to EM-28, "Exploded View". 6. Disconnect clutch tube on transaxle side from clutch damper. Refer to CL-24, "Exploded View". 1. Disconnect vacuum hose from intake manifold. Refer to EM-28, "Exploded View". 2. Remove A/C compressor. Refer to HA-86, "Exploded View". 3. Remove ground cable at engine side. 1. Remove ground cable at transaxle side. 2. Remove drive shafts (RH and LH). Refer to FAX-21, "Exploded View". 3. Remove rear torque rod. 4. Remove stabilizer connecting rod. Refer to FSU-16, "Exploded View". 5. Remove front suspension member. Refer to FSU-18, "Exploded View". • Remove transaxle joint bolts which pierce at oil pan (upper) lower rear side. Refer to EM-99, "Exploded View". 1. Use a manual lift table caddy (commercial service tool) (A) or equivalently rigid tool such as a transmission jack. Securely support bottom of the engine and the transaxle assembly. Put a piece of wood or an equivalent as the supporting surface, secure a completely stable condition. 2. Remove upper torque rod (1), and engine mounting insulator (RH) (2). 3. Remove engine mounting bracket (LH) through bolt-securing nut (B). 4. Carefully lower jack, or raise lift to remove the engine and the transaxle assembly. When performing work, observe the following caution. • Check that no part interferes with the vehicle side. • Before and during this lifting, always check if any harnesses are left connected. • During the removal, always be careful to prevent the vehicle from falling off the lift due to changes in the center of gravity. • If necessary, support the vehicle by setting jack or suitable tool at the rear. 1. Install engine slinger to front cover front left side (A) and cylinder head rear right side (B). 2. Remove starter motor. Refer to STR-27, "MR16DDT : Exploded View". 3. Lift with a hoist and separate the engine from the transaxle assembly. Refer to TM-84, "MR16DDT : Exploded View". Note the following, and install in the reverse order of removal. • Never allow engine oil to get on engine mounting insulator. Be careful not to damage engine mounting insulator. • Check that each mounting insulator is seated properly, and tighten mounting nuts and bolts. • When installation directions are specified, install parts according to the direction marks on them referring to the figure of components. Refer to EM-55, "2WD : Exploded View". Rear torque rod bracket 1. Temporarily tighten mounting bolts in the numerical order as shown in the figure. 2. Tighten mounting bolts to the specified torque in the numerical order as shown in the figure. Inspection for Leakage The following are procedures for checking fluids leakage, lubricates leakage, and exhaust gases leakage. • Before starting engine, check oil/fluid levels including engine coolant and engine oil. If less than required quantity, fill to the specified level. Refer to MA-13, "Fluids and Lubricants". • Use procedure below to check for fuel leakage. - Turn ignition switch “ON” (with engine stopped). With fuel pressure applied to fuel piping, check for fuel leakage at connection points. - Start engine. With engine speed increased, check again for fuel leakage at connection points. • Run engine to check for unusual noise and vibration. • Warm up engine thoroughly to check there is no leakage of fuel, exhaust gases, or any oil/fluids including engine oil and engine coolant. • Bleed air from lines and hoses of applicable lines, such as in cooling system. • After cooling down engine, again check oil/fluid levels including engine oil and engine coolant. Refill to the specified level, if necessary. *: Transmission/transaxle/CVT fluid, power steering fluid, brake fluid, etc. • Air duct, air cleaner case assembly and air cleaner body assembly: Refer to EM-26, "Exploded View". • Radiator cooling fan assembly: Refer toCO-20, "Exploded View". 4. Disconnect control cable from transaxle. Refer to TM-273, "Exploded View". 2. Remove rear propeller shaft. Refer to DLN-121, "Exploded View". 3. Remove drive shafts (RH and LH). Refer to FAX-21, "Exploded View". 4. Remove rear torque rod (1). 5. Remove stabilizer connecting rod. Refer to FSU-16, "Exploded View". 6. Rear front suspension member. Refer to FSU-18, "Exploded View". 7. Preparation for the separation work of transaxle is as follows: • Remove transaxle joint bolts which pierce at oil pan (upper) lower rear side. Refer to EM-40, "Exploded View". 2. Remove upper torque rod (1) and engine mounting insulator (RH) (2). 3. Remove engine mounting bracket (LH). 3. Lift with a hoist and separate the engine from the transaxle assembly. Refer to TM-301, "Exploded View" (CVT models). • When installation directions are specified, install parts according to the direction marks on them referring to the figure of components. Refer to EM-59, "4WD : Exploded View".